A "drip" is a message sent to the customer, and drip campaigns are a sequence of messages, promotional, informational, or other, sent to the customer on a strategically timed basis. 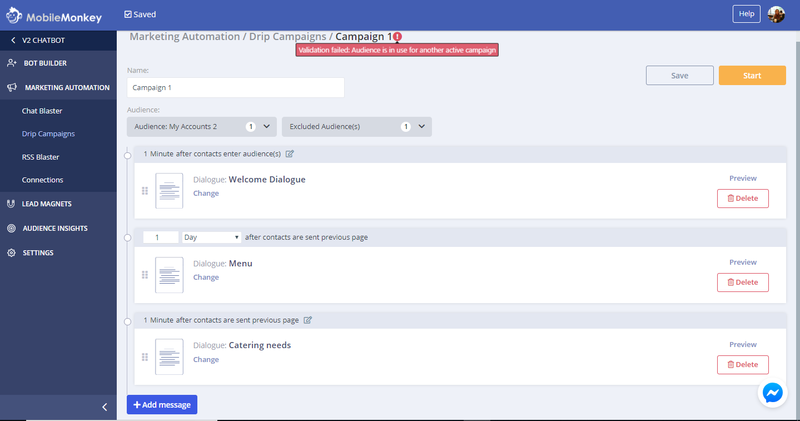 The purpose of a Drip campaign is to automatically engage the right users at the right time. For example, you can set up a welcome drip to message the visitor 1 minute after engagement and then another message the next day. Suggestions for Success: Drip campaigns are very powerful, as long as the messages have good content and are not sent too often. Setting up the drips to launch too close together may be perceived as too "spammy". 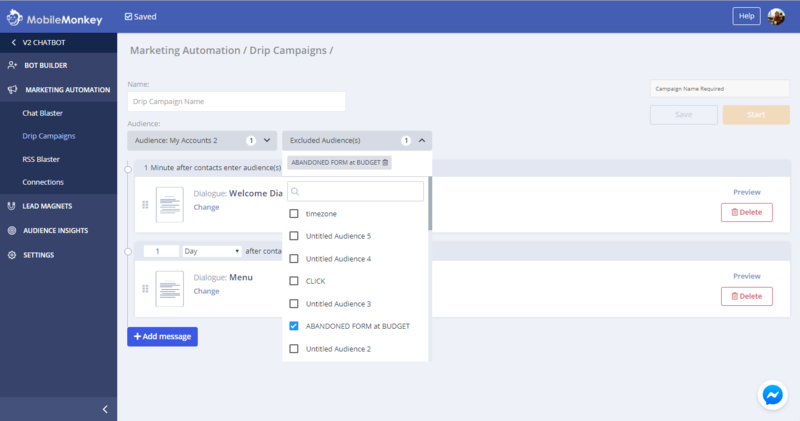 Choose Multiple Audiences to INCLUDE and EXCLUDE on your Drip Campaign. 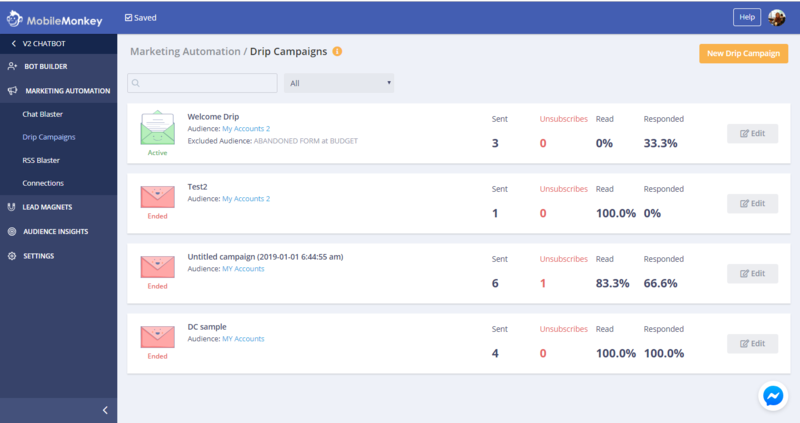 Make sure that none of these Audiences are included on an ongoing Drip Campaign; if you overlooked this one, you will receive an error message: Validation failed: Audience is in use for another active campaign. The changes you make on your Drip Campaign will NOT apply anymore to those already on QUEUED status for that specific Dialogue, but changes moving forward for Dialogues they have not received will APPLY. Inside the your Drip Campaign, click on PAUSE. This will take you back to the list of Drip Campaigns you created. Click on EDIT opposite the Drip Campaign you just paused. 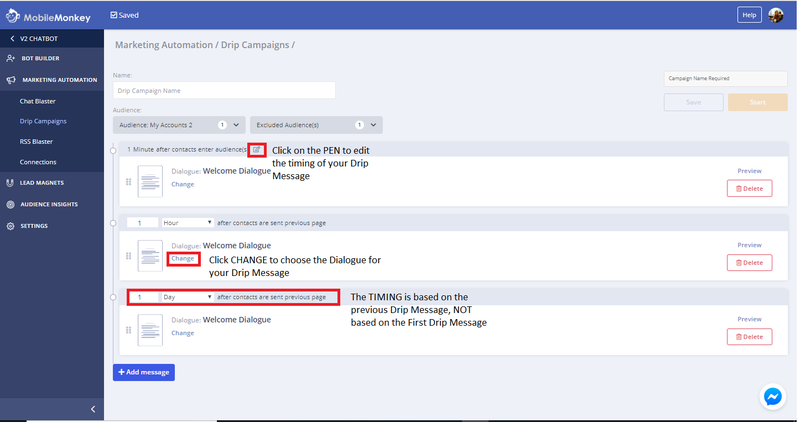 You can make changes such as the timing, the Dialogue and add Dialogue/s to the end of the Drip Campaign. When you encounter this ERROR MESSAGE, it only means you have an ACTIVE Drip Campaign for that same Audience. You may create a NEW Audience name containing the same contacts and you should be good to go! Just make sure you so not overwhelm them with messages. 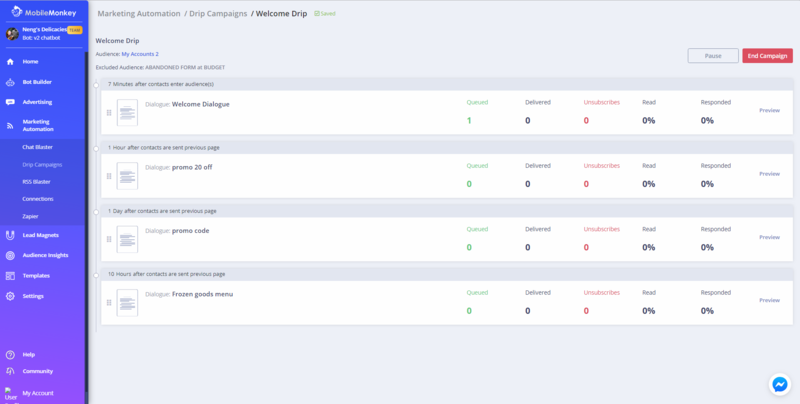 The preview window of your Drip Campaign will show you numbers that are relevant and easy to understand.